Greenberg Traurig, LLP has been recognized by the National Kidney Foundation (NKF) at their annual awards reception. Greenberg Traurig's Stephen Rabinowitz and Ashley LeBlanc accept an award from the National Kidney Foundation. 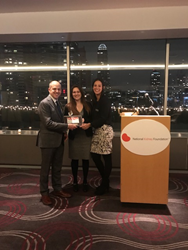 Global law firm Greenberg Traurig, LLP has been recognized by the National Kidney Foundation (NKF) at their annual awards reception, Feb. 1, at Upper Story in New York City. The firm was honored for raising more than $40,000 for the organization through their participation in Law Rocks NYC. Law Rocks NYC is a battle of the bands that promotes music education for underprivileged youth and raises money for local nonprofits. Greenberg Traurig’s house band “The Meltones” played for the NKF serving Greater New York in support of Greenberg Traurig Shareholder Kenneth Zuckerbrot, who had been battling kidney disease and underwent kidney transplant surgery on Oct. 30, 2017. The award presented by NKF was accepted by two members of The Meltones, Stephen L. Rabinowitz, co-managing shareholder of Greenberg Traurig’s New York office and chair of the New York Real Estate Practice, and Litigation Associate Ashley A. LeBlanc. Rabinowitz plays the guitar and LeBlanc is on vocals. Other members of The Meltones include: Miami Real Estate Shareholder Burt Bruton on guitar; Christopher A. Cernik, Albany Government Law & Policy shareholder, on the keyboards; Thédoor Melchers, Amsterdam Corporate & Securities shareholder, on trombone; Jim Mussen, technology specialist, on drums; Tracy Newirth, practice development coordinator, on vocals; Tony Hatchett, business director of the Atlanta office, on vocals; firm alumni Daniel M. Rabinovitz and Daniel Blumberg, on trumpet/vocals and bass, respectively; and special guest Chuck Langford on saxophone. According to the organization’s website, NKF is a major voluntary nonprofit health organization dedicated to preventing kidney and urinary tract diseases, improving the health and well-being of individuals and families affected by kidney disease, and increasing the availability of all organs for transplantation. For more information, click here.